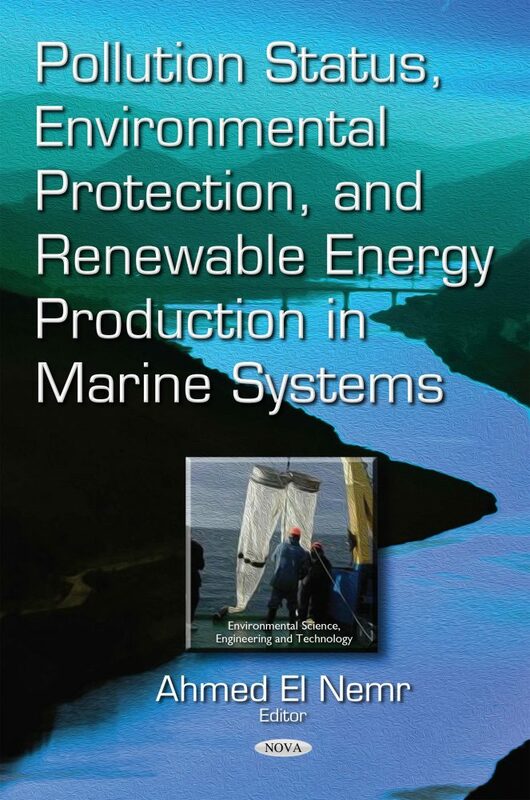 Pollution status, environmental protection, and renewable energy production in Marine systems are the main targets of this book that represent the contents of the third volume of the Blue Biotechnology Journal, published by Nova Science publishers, New York, USA. The book is divided into 20 Chapters. The first chapter reviews the environmental protection from thermodynamic properties, the performance of refrigeration cycles and air-conditioning. The second chapter represents the pollution status along the Red Sea. During last ten years of twenty century till now, inorganic and organic pollutants has been detected in many sites of the Red Sea. The third chapter covers the adsorption of the anionic dye Direct Red 23 onto new activated carbons developed from Cynara cardunculus: kinetics, equilibrium and thermodynamics. The fourth chapter reports the Mercury as toxic metals levels in surface sediments along Alexandria west coast, Egypt. The fifth chapter investigates the effects of essential and non-essential metals on the human health. Chapter six covers a review of oceanography and topography of the Red Sea and Arabian Gulf. Chapter seventh reports the marine plankton and genus Ceratium in the west coast of the Red Sea. Chapter eight covers the energy efficiency improvement utilizing high Technology: The path forward for renewable energy use in industry, buildings and sustainable development 183. The ninth chapter investigates the bioethanol production from shrimp shell waste Using Marine Alcaligenes feacalis MS7 and Candida albicans ATCC 14053. The tenth chapter covers the comparison of two packages for tidal analysis and prediction: an exemplar case study of Abu-Qir Bay, Alexandria, Egypt. Chapter eleven reports the physico-chemical studies of Suez Canal water from port said to Suez for its evaluation and protection. Chapter twelve covers the morphological structure of bays and sharms as a factor affecting in distribution of marine physics parameters, the Red Sea. Chapter thirteen investigates the suitability of Lake Mariut Drainage System (Qalaa and Umum Drains Waters) for Water Reuse. Chapter fourteen reports the water and nutrient budgets of Lake Burullus, Egypt. Chapter fifteen covers the geological model delineation of sub-marine system channels in west delta deep marine concession, Egypt. Chapter sixteen reports the synthesis and antimicrobial of 5-(4′-bromobenzyl)-1,3,4-thiadiazole-2-amine derivatives. Chapter seventeen recorded the isolation and characterization of chitinolytic actinomycetes from estuarine origin in South India. Chapter eighteen reports the isolation of extremely halophilic bacterium Bacillus trueperi. RRJS1 optimized with physico-chemical factors and nutritional sources for protease activity. Chapter nineteen investigates the toxicological studies on the Red Sea Pufferfish Arothron hispidus (Linnaeus, 1758) and River Nile Pufferfish Tetraodon lineatus (Linnaeus, 1758). Chapter twenty reports the studies on the various allometric relationships in the intertidal horse mussel Modiolus auriculatus of the Red Sea, Egypt.